Instagram wants to use algorithms to pad your feed — on Monday, August 20, Instagram announced a test for recommended posts. The potential feature suggests posts based on who you follow as well as the different photos and videos that you tap that heart icon on. Unlike recommended posts on Facebook, however, Instagram isn’t slipping the recommended posts in mid-feed. Instead, the suggestions come after you have already seen the latest posts from your current network. Once you see that new message that says you’re all caught up, you will see recommended posts or can tap to view the old posts instead. The recommended posts look similar to the typical feed photo, except for the “Recommended for You” label, along with a blue icon to start following that user. The test also isn’t the first time Instagram has tried out recommended posts. Without a share button, finding new users to follow on Instagram differs from networks like Facebook and Twitter, where a share or retweet adds posts from users that you don’t already follow into the feed. Adding recommended posts to the feed could make it easier for users to find new accounts to follow based on what they have already liked on Instagram. On the flipside, the Recommended Posts could make Instagram feel more like its parent company Facebook. Some users also may not want to see posts from outside their network — though placing the suggestions behind all the posts from followed users should help appease those that want more control over what they see in the feed. The Recommended Posts comes after a handful of changes for the visually focused social network. Earlier this year, the network launched that “you’re all caught up” icon. The network also improved algorithms to prioritize newer posts. While the feed has factored in when the image or video was shared since moving away from the chronological feed, Instagram is now giving time and date more weight. 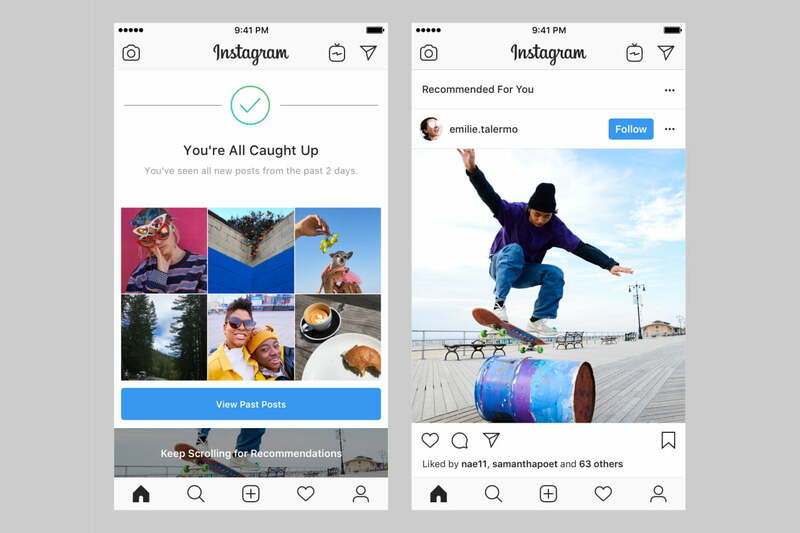 The Recommended Posts is just a test — Instagram says some users will begin to see the feature over the next few days. The company says it will consider user feedback and hope to roll the feature out to more users over the next few weeks.